Link to Map Quest Potter Valley page Where in the World is Welcome Ranch?? 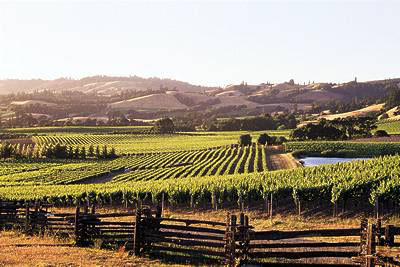 We live in Potter Valley, one of the fertile inland valleys of Mendocino county, Northern California. 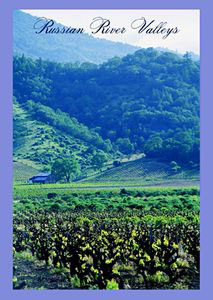 The nearest "big" town is Ukiah, and we are mere minutes from the growing resort area of Clear Lake. Welcome Ranch is appoximately 2 1/2 hours north of the legendary city of San Francisco, 3 hours northwest of the state capital, Sacramento, and a curving, leisurely, one hour drive through the redwoods from the famous Mendocino Coast. We are working folks, so please email/call ahead to schedule a visit to the ranch. We would be happy to give you the low down on best driving routes, easiest airports to fly into, best little - known local accomadations, secret fishing holes, etc. One weekend monthly we hold an open house/open barn for ranch tours. You are welcome to bring a picnic lunch along with you and relax by the river. We also host an annual Harvest Festival/Barn Blessing in the fall to celebrate our bounty. This is a gorgeous area that invites you to linger and explore. Mendocino county can be quite seductive. It is well worth planning a weekend (or longer!) escape here while you visit the ranch. This is a major wine grape growing region. Wineries, from the well known Fetzer to the many small/esoteric operations, welcome connosieurs and simple palates alike for tasting and tours. If beer is your weakness, there are many colorful local breweries from Ukiah to Andersen Valley to Fort Bragg, serving up frosty mugs of Red Tail Ale, India Pale Ale or Scrimshaw Ale among other tempting brews. Since wine afficianados usually have fine taste in food as well, there are oh so many gourmet restaurants in Mendocino county. Menus feature everything from Thai to organic vegetarian to seafood to one of the best rib-eye stakes you have ever eaten. One must see while you visit is the dramatic Mendocino Coast. 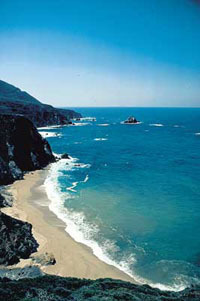 Hiking, shopping, even whale watching are available along the north coast. One very popular destination is the town of Mendocino, a cool artist colony sitting directly on the rugged bluffs overlooking the ocean. Though verging on a little self-conciousously chi-chi, Mendocino is a charming place to shop, have a nice lunch, and get some local crafts or custom made chocolates. Many romantic bed and breakfast inns are available nearby. Further north, Fort Bragg is the commercial center on the coast. It, too, is not lacking in attractions. We reccomend stopping at the North Coast brew pub for some Red Seal Ale and a great meal. Or you can have some fried clams and watch the fishing fleet at Noyo Harbor. For equestrians, Ricochet Ridge Ranch just north of Fort Bragg offers excellent horse back riding directly on the beach. Their rental string is top notch. If you have your own mount with you, they will board horses overnight while you camp at nearby Mackerricher State Park. Wait, we're not done yet! Other local attractions include Seabiscuit's retirement home, Ridgewood Ranch. Seabiscuit's owners, the Howards, had grand acreage up here near Willits and the historic barn and grounds are available for tours. 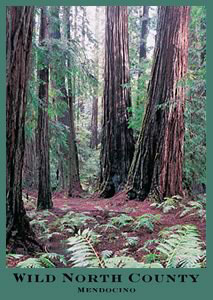 Following highway 101 further northward will take you into Humboldt county and some of the biggest redwoods in existence. These great, ancient forests are nature's verdant, foggy cathedrals. If you haven't seen the redwoods, you owe this trip to yourself and family. Heading south on 101, through Ukiah, will bring you to Vichy Springs and the natural mineral baths that were one of Mark Twain's favorite haunts. Sit and soak for a spell. Further south, the town of Hopland offers antique shops, local wines and the Solar Living Institute, a demonstration center for low impact living. As for Potter Valley itself we are kinda low key. There is the Memorial Day Parade with floats pulled by tractors, and eager, costumed 4-Hers. Folks watch from their lawn chairs propped along Main Street. The Potter Valley Rodeo, with its bull riding and barrel races, is on the same weekend. One perpetual highlight here is the Potter Valley Cafe. This un-assuming, cozy eatery, with original watercolors on the walls and checker table cloths, is frequented by the locals for good reason: The food is absolutely great. We are talking Green Lipped Mussels, Beef Wellington, Glazed Duck and Shrimp Louis great. Their more pedestrian fare, Meat Loaf, Shephards Pie, Biscuits and Gravy, are all made with scrumptious flaire. The home-made pies are to die for and they host live music on the weekends. All this and you don't even have to dress up. Don't miss it! Finally, for the outdoorsy, a drive through the valley then up to Lake Pillsbury provides hiking and water sports. We have compiled a list of links (see below)to help you plan your trip here. We encourage you to make your visit a celebration! Life is too short not to take every opportunity to have fun. Ukiah based pioneers in the American Craft Brewing Renaissance. A resource for Mendocino county dining, lodging, wine tasting and more. Get a taste of the local art scene. Good, I mean GOOD, Horse back riding on the beach near Fort Bragg.